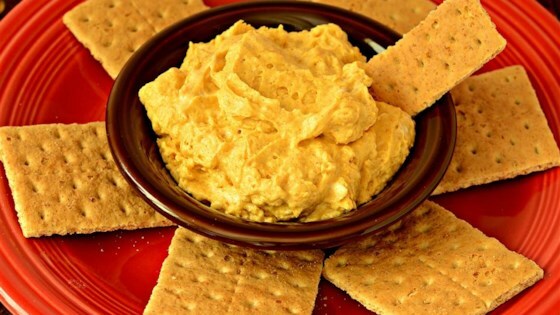 "Fluffy and creamy pumpkin dip that goes great with graham crackers and ginger snaps." Beat cream cheese in a bowl with an electric mixer until smooth; mix in pumpkin puree until smooth. Stir confectioners' sugar and pumpkin pie spice into mixture until evenly mixed; fold in whipped topping. Cover bowl with plastic wrap and refrigerate for flavors to blend, about 2 hours. This is the perfect holiday dip. Tastes like pumpkin pie with whipped cream. Love this I made this healthy. I used low fat cream cheese and sugar free whip cream and stevia. I also added pumpkin spice season. Yum.